Ribbon Review: A film which fails to rise above average! 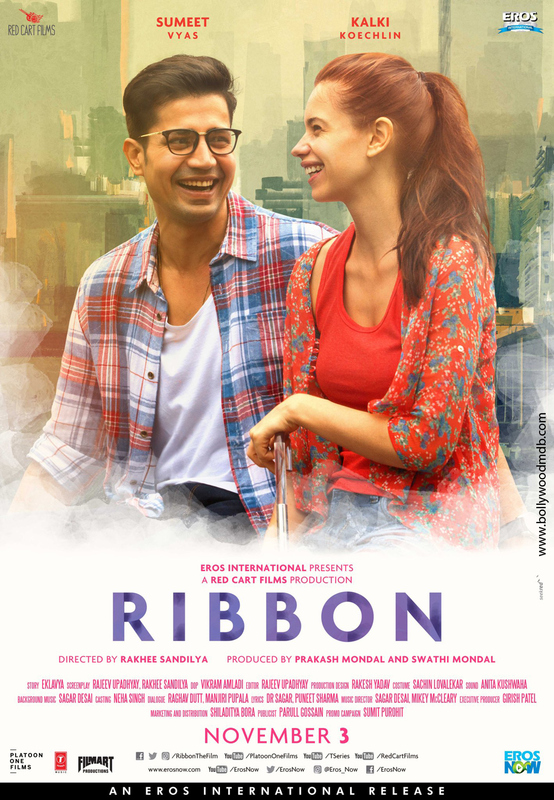 Starring Kalki Koechlin and Sumeet Vyas in principal roles, Ribbon is a film which targets urban audience. It’s a story about an urban couple navigating through an unexpected pregnancy. Sahana Mehra (Kalki Koechlin) and Karan Mehra (Sumeet Vyas) are a working urban couple who are trying their best to make both ends meet. But an unexpected pregnancy augurs an eventful journey for them. Their happiness knows no bounds when they become parents to a beautiful baby girl but little do they know that parenthood comes with its own challenges. How they deal with their life theron forms the crux of the story. Ribbon is Kalki Koechlin's second release in a row after Jia Aur Jia, which hit screens last Friday and flopped without creating any buzz whatsoever. While she failed to leave any mark in her last release, her performance in Ribbon is above average. Here, she plays a working mother who is trying to strike a perfect balance between her professional and personal life. She tries to play her part sincerely but in the absence of a powerfully written character, her performance ends up being a futile exercise which yields nothing concrete. Kalki is no doubt a brilliant performer but no artist can do anything if the part he or she is playing has no brilliance. She seriously needs to pick up good, author-backed characters to exploit her full potential. On the other hand, Sumeet Vyas, the male protagonist of the film, also puts up an average show at display. There are certain scenes where he does impress, but his performance doesn't remain consistent throughout the film. Supporting cast is as average as it can get. Rakhi Sandilya marks her directorial debut with the film. She tries to tell a story which is not new in Bollywood's playbook. However, she had a chance to deal with the same story in a different way, but she fails to do that. As an audience member, you fail to understand what she is trying to establish through the film. It lacks correlation between what happens in the first half and what unfolds in the second half. It does shock you but temporarily. Overall, Rakhee’s efforts might not get her the kind of recognition she would have dreamt of. The film is average or below average in all departments. From editing to storyline, the film is bland throughout. Camera work is poor and so is the production design. There are many loopholes in the film which don't meet even by the time the film reaches its conclusion. The film has an extremely average album. It shows only two songs on-screen which are, as expected, extremely poor. Like the whole film, its music also disappoints you big time. Ribbon doesn’t offer you anything which is out-of-the-box and keeps you hooked. Watch the film, if you really feel like spending your money on an extremely average offering.